Arjon van Dam, the same developer behind the work in progress adventure game ' Futurama ' and 'Leisure Suit Larry in the Land of the Lounge Lizards (AGI)', has recently announced SRAM 2 - CINOMEH'S REVENGE, a PC remake of the late 80's text based adventure game which was first released for the Amstrad CPC and PC ( MS-DOS ). Now you probably haven't heard of this game before, that's because it is rather obscure and was entirely in French. With Arjon Van Dam's talent the game will be released for the PC and Linux and completely in English. 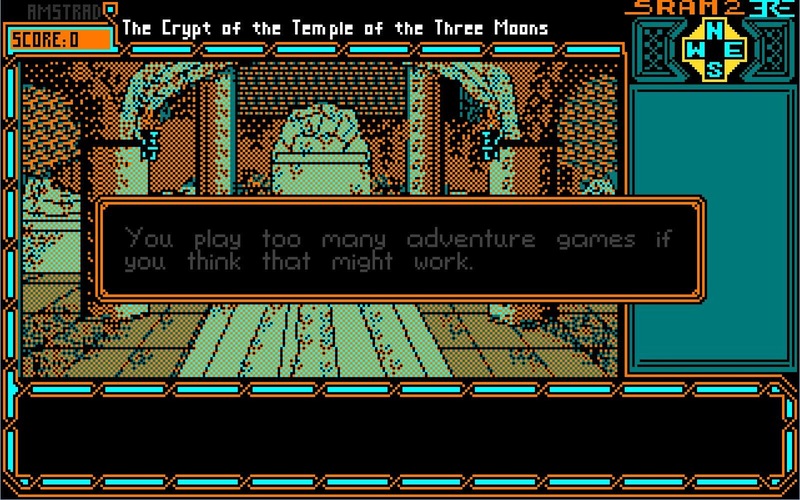 But that's not all, as the developer hasn't just limited you to the 1980's Amstrad graphical colours, but during the game you can switch to 30 other graphical modes ranging from the Amiga, Apple II, Atari 8-bit, BBC Micro and Game Boy, to the C64, Commodore VIC 20, DOS CGA, MSX, NES, SMS and ZX Spectrum, with multiple versions also available with each specific system. For a retro gamer this sounds pretty impressive, the only downside is will this game actually be finished, because the other two games in development have gone silent.